Divya is an immerser. She's one of those people who plunges herself into a new situation with great determination and seeks the thrill of new things. That's how she found herself on a local Dayton news station after only living here a few months. That's what drove her to leave her childhood home in Singapore to come study in the States for college. And that's what led her to Sparkbox. 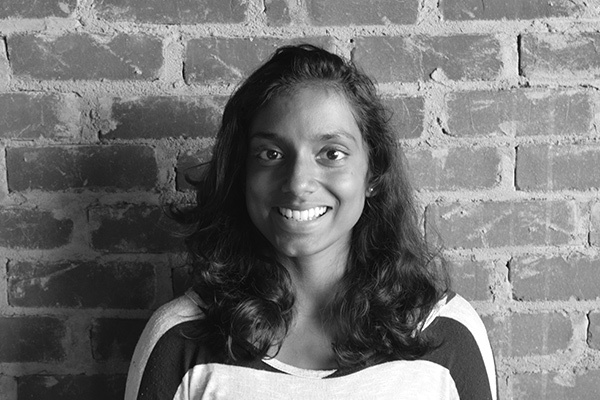 After watching Ben speak at Artifact Conference in 2013 and hearing about our apprenticeship program, Divya decided to throw her hat in the ring for what “felt like a perfect opportunity.” She was done with the credits for her Digital Media degree at Clark University and was looking for something else to do. Unlike a lot of other people who might take that opportunity to goof off for six months, Divya saw the chance to keep learning as an apprentice. And, boy, are we glad she did! Because after impressing us for six months with her determination and skill as an apprentice, we decided to bring her on as a fulltime developer. We could talk about everything Divya does outside of work, but that would probably take about five hours to read. In short, (which Div knows all about), she'll pretty much try anything new, loves being outdoors, and loves making things. Whether it's a website, sewing, cooking or lampworking, Divya loves to create. You can usually find her on her bike, at the downtown indie theatre, rock climbing, and just generally exploring different parts of the city and meeting new people where she can. If you need a recommendation of something awesome to do in Singapore, Boston, or Southwest Ohio or just want to meet a generally cool person, give Divya a shout.